Install our new iPhone application today to receive and access your form submissions anywhere! Reply or Forward your submissions right from your iPhone. JotForm App is a simple but very powerful iPhone application. It is designed to work similar to iPhone's original Mail app so that you will find yourself in a familiar environment. Many things that work on iPhone Mail app will also work on JotForm app. For example, you can flip it sideways, roll your finger sideways to delete an entry, reply to submissions, click on Phone numbers to instantly call, browse and drill forward and backwards in a tree-like navigation. For the first version of JotForm App, we kept things simple. If you have any suggestions, please send us an email. You can use your existing JotForm username and password to quickly log into your JotForm account. 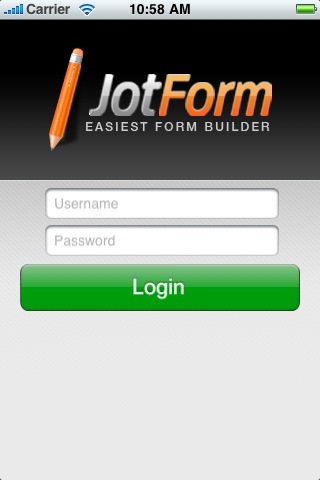 Even if you are using JotForm on someone else's iPhone, you can log-out later. When you log into your account, you will see three section. JotForm Application is designed to work in a similar way as the iPhone Mail application. You can drill down on any section and use the back buttons to go back to previous page. On "Recent Submissions", you will find a list of recent 30 submissions and you can continue viewing older submissions from there. On "My Forms", you will see a list of your forms and you can view recent submissions on them easily as well. On "Search" you can do a keyword search on all of your existing submissions on all of your forms. Logout button allows you to logout from your JotForm account on this iPhone. Use arrows on the right top corner to browse your submissions. Browse your forms using the My Forms page. You will see counts for your total number of submission and submissions you received today. You can click on any form to see recent 30 submissions. Do a keyword search on all of your submissions in all of your forms. Search form will bring results quickly while you are typing the keywords. List of 30 recently received submission summaries from your forms listed in time order. When you reach the bottom of the list, you can get more results. This list is updated instantly when you receive a new submission. Click on the refresh button to update the list manually. Flip your iPhone sideways to see the list in a landscape mode. You can also move your finger sideways on a particular submission to delete it.